Ford Racing Parts: Mustang Power Packs, Crate Engines, Motors, Superchargers, Handling Packs, Shelby Parts, Wheels, Brake Kits, SVT parts, and more. Welcome to Ford Racing By Speedshop Direct.com. We are a factory authorized full service Ford Racing Parts warehouse distributor ready to serve your Ford performance needs from coast to coast. We also export worldwide to Ford enthusiasts everywhere. We have access to the entire Ford Racing Parts catalog. Shopping here is easy. Just type in what you are looking for in the Quick Search box to the left. You can also browse through our online catalog with the menus on the left to search by vehicle or product. Please call us if you cannot find what you're looking for. 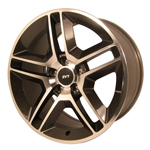 Are you looking for genuine Ford Racing Wheels but not sure which ones look the best? Did you have a little accident and need to find a new reasonably priced OEM replacement. Or, are you looking to upgrade your wheels? Ford Racing offers a lot of the same OEM SVT and performance wheels for a fraction of the price the local dealer offers them. They are the exact same wheel, but Ford Racing uses a different part number system in their catalog. Ford Racing also offers the OEM wheels in other finishes like chrome or black painted. Remember, only genuine wheels from the Ford Racing Catalog come with the OEM center caps, OEM quality, and the Ford oval casting on the back. Ford Racing offers the real wheel deal at bargain "replica" prices. Do you have a project car and are looking for a high performance Ford engine? Ford Racing has the selection you are looking for. Ford Racing develops and produces their performance crate engines under strict testing and quality control processes utilizing all quality parts. Only FRPP crate engines are backed by Ford Racing's 24,000 mile/24 month warranty. Ford Racing crate engines are the best value out there. Don't take a chance on the other guy's machine work and rebuilt blocks. Have peace of mind knowing that your engine is built and backed by the blue oval.